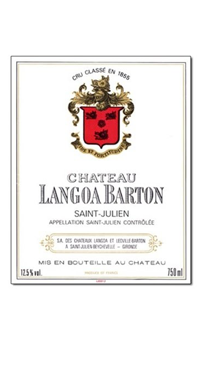 Chateau Langoa Barton and Leoville Barton have been under ownership and direction of the Irish Barton family for many generations. The 17 hectares of Langoa are planted in gravelly soil with a clay sub-soil, include large proportions of old vines in order to obtain the best possible quality. Langoa Barton’s terroir is composed of 57% Cabernet Sauvignon, 34% Merlot and 9% Cabernet Franc. The appellation Saint-Julien is generally considered to be one of the very best wine producing areas in the world and Châteaux Langoa is situated in the very heart of this region.